Which Jurors are Lying to You? How honest are your potential jurors? I don’t know about you, but in the past, I’ve seen more than my fair share jurors who lie. And the sad part is, there doesn’t seem to be any guaranteed way to catch them. In a two week span, I selected juries for five different cases. And in almost every single case, at least one juror lied to me, my opponent, or the court. In criminal cases, one of the issues we almost always inquire about is whether any of the jurors have ever been charged with a crime. We explain that it doesn’t matter whether it was a misdemeanor or a felony, and it doesn’t matter whether it was dismissed or whether they went to prison. Usually, one of the attorneys will ask a question like, “Have you, or someone close to you, ever been arrested or charged with a crime?” Then we’ll ask for a show of hands to see who falls into that category. Probably every criminal prosecutor and defense attorney asks something similar, because it’s important for us to know whether or not any of the potential jurors have ever been charged with a crime and how that experience is going to shape their perceptions of the evidence and proceedings in this case. In the five cases I tried, every juror on every panel was asked whether they had ever been charged with a crime. But here’s the interesting twist: We weren’t trying to discover whether or not they’d ever been charged with a crime. We already knew what what their answers should be. In one of the jurisdictions where I practice, the prosecutors have access to a statewide criminal history program and can run a criminal history check on every potential juror. In addition, they have a computer in the courtroom so they can pull up more detailed information from the clerk’s office or their case management system. So if we weren’t trying to discover whether or not they’d been ever been charged with a crime, why were we asking the question? Because we wanted to determine which jurors would be honest about it. Every juror on every panel was asked whether they had ever been charged with a crime, and in almost every single case, at least one of them lied. Another was asked, “Why didn’t you tell us about the time two years ago when you were sentenced to probation after you got caught acting as a lookout for a burglary?” Confronted with the details, he shifted uncomfortably in his chair, then said he thought “it didn’t count,” because he hadn’t been adjudicated. There were a few other notable comments, but the most memorable was the guy who’d been arrested, convicted of a crime of violence, and sentenced to a lengthy jail sentence. His reason for not telling us? He “just didn’t want to.” If we hadn’t had the details of his arrest and conviction in front of us, we never would have learned about his prior arrest, and it would have changed the dynamics of the entire jury panel. 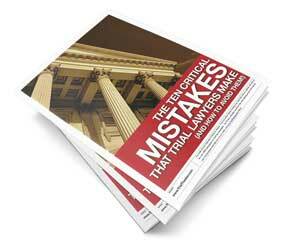 Unfortunately, these lies may not be uncovered until after they’ve affected your verdict. For example, there was a $28,000,000 plaintiff’s verdict that was thrown out and a new trial ordered because three jurors lied during jury selection. The defense attorney had asked whether anyone had ever been involved in a lawsuit. Two of the jurors didn’t raise their hands at all (one had been sued twice, the other three times), and the third admitted she’d filed a lawsuit, but didn’t mention the other nine times that she’d been sued. We don’t want to believe it, but some potential jurors will lie to us. These lies affect the integrity of the jury system and the validity of your verdict. I wish I could give you a secret formula for catching every lie and keeping those potential jurors off of your jury, but there’s no perfect solution. The best I can recommend is that you make a clear record so that you can ask the court for help if you do uncover a lie. First, ask the questions. Ask specific questions. And if you have any doubts about a juror, ask them directly. The more specific and direct you are, the less wiggle room they have, and the more likely it is that they’ll be honest. Second, don’t leave any room for ambiguity in the record. If you ask, “Has anyone ever been arrested for any crime?” and none of the jurors raise their hands, make sure you create a record. Say something like, “None of the potential jurors raised their hands” or, “Let the record reflect that no one has raised their hand.” Then, if you discover that one of the jurors has a criminal record, the court will have something to act upon. Without that statement, your appellate record will be ambiguous as to whether or not the any jurors responded to your question. You won’t be able to catch every lie, and not every lie you catch may matter. But if you do catch someone in a lie and you think it affected your verdict, you need to make sure that your court record lets the trial court or appellate court help you out. If a person gave away your body to some passerby, you’d be furious. Yet, you hand over your mind to anyone who comes along, so they may abuse you, leaving it disturbed and troubled — have you no shame in that?